Black Oncom Starter ( Black Oncom starter and rice powder ) 20 Gr. Our potent Oncom Starters are produced via a traditional process, which gives the tempeh that special taste. 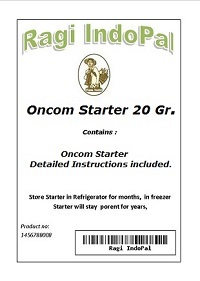 Our Oncom Starter Kit can produce more then 10 Lbs Oncom!, and contains enough starter for 4 batches. Every batch gives you 8 cups of FREE soymilk! The Oncom culture contains spores of a Rhizophus Oligosporus Culture mixture, and rice powder, needed as a mixture medium, which makes oncom, and keeps the traditional taste! Our prices and shipping are the best, and produces 10 lbs Oncom. Oncom is closely related to tempeh; both are foods fermented using mold. Usually oncom is made from the by-products from the production of other foods -- soy bean tailings (okara) left from making tofu, or tempeh. Since oncom production uses by-products to make food, it increases the economic efficiency of food production. . It's easy to make oncom at home at a very low cost. Soybeans are soaked overnight, cooked for about 30 min, grinded, and mixed with oncom starter. After 28 to 32 hours incubation you have delicious fresh oncom. Starter kit can produce more then 10 lbs Oncom. After the straining process, you have about 8 cups of free soy milk !, mix it with sugar or/and vanilla, and keep the bottle in the refrigerator until cold ( next day ). Now you can make your own Oncom, just order our Oncom Starter, we include clear instructions. Shipping is cheap, and soon you will be eating your own Oncom, and FREE Soymilk. 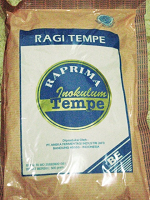 Contains: Black Oncom Starter (Rhizophus Oligosporus Culture mixture), Rice Flour. Does not contain MSG or preservatives. GMO free.